Here's a riddle: What has opened 10 stores in Toronto within the last three years, has two locations within just a few blocks of each other on Queen St. West, and isn't Starbucks? It's the Kind Exchange, a Toronto-grown chain of used clothing stores that's rapidly taking root in neighbourhoods across the city. What began with a single store on Queen West has expanded from Roncesvalles to Yonge and Eglinton to the Beaches, with four new locations opening this spring alone. The next one - the chain's 10th - will open its doors at 1185 Bloor St., near Dufferin, in two weeks. 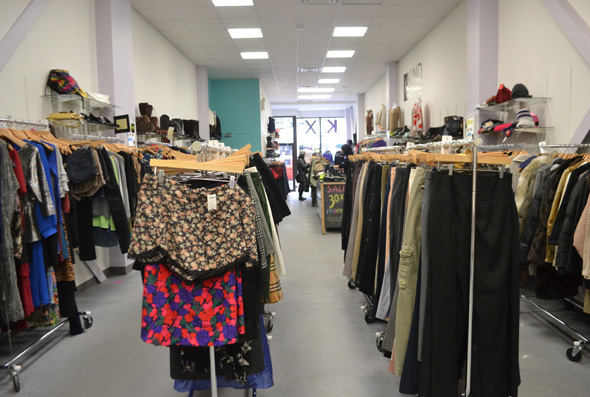 For those who have never trawled through KX's many, many racks: The chain is stocked entirely with used items chosen by the store's staff from hauls brought in by customers. Items are generally priced to move. (If your items are chosen, you can opt for an on-the-spot cash payout - generally 20% of the selling price - or store credit, for 30%.) This differs from most consignment stores, which wait until your used items sell before giving you your share of the sale. In terms of hunting intensity levels, it's a far easier shopping experience than the thrift store, but requires considerably more digging than your artfully "curated" high-falutin' new-and-vintage boutique. Some visits, you'll go home empty-handed; other days, you'll find your new favourite wardrobe item. Not everything will work for you, but all of the items the buyers select - which, though sometimes well-loved, are free of stains, rips and holes - are brought in with the knowledge someone, somewhere, will look absolutely smashing in it. There's also a charitable element to the store - a portion of the proceeds are donated to the Canadian Cancer Society. One of the store's latest locations - Kind Exchange Cares, near Danforth and Woodbine - donates the profit from everything sold in the store. "That first year was really tough. Was really, really tough. But we really fought for it." The store's following (online and in real life) grew, and buyers - and sellers - began flocking in, with folks dragging their bags of closet castoffs to Queen West from all over town. Eventually, the lightbulb went off. Now, Wexler says, "We are opening stores because our customers would tell us, 'You gotta have a store on the Danforth. You gotta have a store on Bloor Street. You gotta come to the Annex. Oh, the Beaches - this is perfect for the Beaches.' It's the best way to grow." 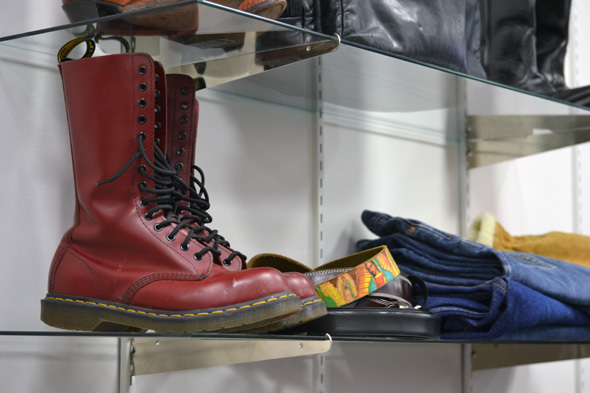 Most clothing boutiques, naturally, are content to let people come to them - their stock would be the same anywhere in town, and one location is often enough for a small business to manage. But if you're cleaning out your closet, the convenience factor of having a consignment store just down the street where you can drop off your old threads is a powerful draw. "Let's not pretend Toronto is an easy city to drive around, OK? So if I have people coming from the Beaches down to Queen West to sell their clothing and be part of it, then I'm going to go to the Beaches." There's another built-in bonus to rapid expansion that comes with the business model. "What it does allow me to do, is I can buy at my current stores for new stores," Wexler says. 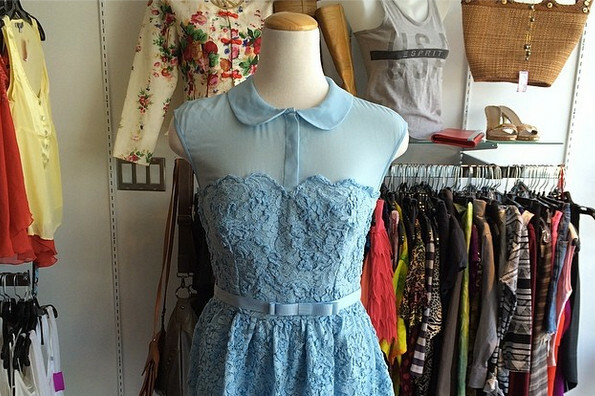 "I might be able to buy 100 items at Bloor St. in the Annex for a new store in the Beaches. ... They can sort of feed off each other, which is great." The Kind Exchange's popularity isn't the only indicator of Toronto's current appetite for cheaper clothing (or, perhaps, a desire to spin closet items into cash during lean times in an already-expensive city). On the same stretch of Queen St. West as the original Kind Exchange, there's Fashionably Yours, Consign Toronto, and the soon-to-open Garb - though the bulk of the city's other consignment stores focus on name-brand and designer items (Common Sort is a notable exception to the rule). "The high-end market is great - that's its own world," Wexler says. "I came from high-end designer consignment, and I think there's a world for that, too, but I really want to be applicable to everybody." In the wake of its rapid expansion, the chain's next moves include a revamped website that'll include clearer directions to prospective sellers, so they know what each store is and isn't accepting at the moment (thereby avoiding disappointment when you cart a bag of black pants to a store already brimming with extra pairs). But even after all this growth, Wexler says, the company is far from done - in fact, he's still looking for location suggestions. "Where would you want to have a Kind Exchange - from Vancouver to PEI? "Send us an email. Tweet at us. Come say hi." Store photos by Erin Jones. Outfit photos via The Kind Exchange on Instagram.